Yeah, like ones that should have died when slavery was abolished 150 years ago. 2. How in the hell do people text while they use the elliptical machine? Either they are far more skilled than I am at texting or I am working harder than they are because I am lucky if I can start the MapMyFitness app while I’m trying not to fall off the damn thing. 3. You never know who is watching your progress. One of the trainers pulled me aside and asked me how much weight my husband and I had lost. She told me she noticed that both of us are significantly smaller since we started working out and that every time we come in, she noticed that we are smaller each week. We introduced ourselves, and I told her that one day I’d be brave enough to try one of her Zumba classes. She invited me to come to her low impact class. I think I might give it a try. I promised earlier that I’d make a list of the proteins I eat, in order of how well they “stick” with me–in other words, which ones provide me the most satiety for the quantity eaten. There are some proteins that I can eat small quantities of and feel satisfied, and then there are others that it feels like I could eat endlessly and never feel satisfied. Please note: I do NOT use protein supplements like protein powders, bars, or shakes. I could pontificate all day about why I don’t and why I refuse, but that is a post for another time. I choose to get all my protein from actual food, not something processed that comes with a label and a high price tag. But that’s just me. And maybe it sounds snotty, but I choose to fuel my body with food that came from a plant or an animal. If protein shakes/bars/powders are your jam, that’s your prerogative. I simply refuse to ingest them. 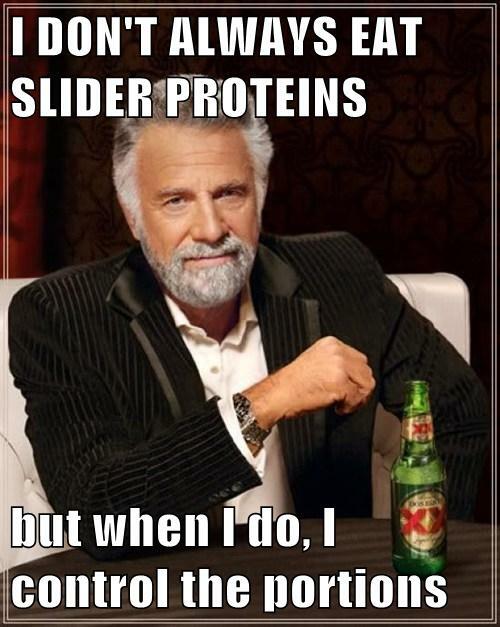 I’ll start with slider proteins. These are protein sources that go down really easy whose quantities I really have to watch because if I don’t, I will eat more than I ought to. Then there are proteins that don’t slide down as well. They’re pretty dense in my tummy, and I can eat a small quantity and be satisfied. I try to eat these more often. Those are all the ones I can think of at the moment. On an every day basis, I try to eat more dense proteins than slider proteins, but sometimes blackened trout just sounds AWESOME. That’s all I’ve got tonight. This entry was posted in exercise, habits, la guerra, little things, oh behave!, post-op, the sleeve, vsg, weight loss surgery, werk! and tagged dense protein, eating, exercise, food, la guerra, post-op eating, post-op life, protein, reflections, she's got skillz, sleeve gastrectomy, slider proteins, the body is a funny thing, the sleeve, VSG, vsg realness, werk!, WLS, workin' on my fitness. Bookmark the permalink.